At the Oceanic Institute, the project “Integrated Multi-Trophic Aquaculture of Shrimp and Sea Cucumbers for Nutrient Recycling, Sludge Reduction, and Creation of Additional Revenue Streams” is investigating Integrated Multi-Trophic Aquaculture (IMTA), where “waste” nutrients from a “fed” species is taken up and incorporated into the biomass of another commercially valuable “extractive” species. Such a management strategy improves nutrient use efficiency, reduces waste volume and disposal costs, and creates an additional revenue stream. The current project investigates an IMTA approach using sea cucumbers to digest waste produced from shrimp production systems. 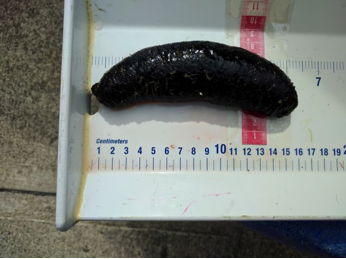 To date, researchers have collected, quarantined and PCR-screened several sea cucumbers. It was determined that two species, H. atra and A. mauritiana, could be collected in sufficient numbers for Year 1 trials. To investigate growth, survival, and sludge processing capability of these species, 48, 1.5-m3 mesocosm tanks with a sand layer on the bottom were used. A high-density (350 shrimp/m2) RAS shrimp trial was carried out to provide sludge for sea cucumber trials. Average survival rates for H. atra and A. mauritiana were 43.8% and 4.2%, respectively. A. mauritiana was determined to be unsuitable for future trials relying on wild caught specimens. No significant differences were detected in specific growth rates between H. atra treatments. However, this species was observed actively feeding during the course of the trial, and guts of specimens from Sludge and Algamac treatments were found to contain sand and algal matter, respectively. This shows that animals were feeding on RAS sludge (and Algamac) and potentially growing (converting RAS waste into biomass). More detailed results from this ongoing project will be presented in a forthcoming issue of e-Notes. Also at the Oceanic Institute, researchers working on the project “Potential of Black Soldier Fly as a Feed Ingredient to Support Hawaiian Aquaculture,” have determined the nutritional profile of raw Black Soldier fly larvae, including fatty acid and amino acid profiles, mineral, fiber, and proximate contents. This data will be very helpful in evaluating Black Soldier Fly’s potential as a feed supplement for local aquaculture feed production in Hawaii. Year 2 of this project will highly benefit from the data that was obtained during Year 1. A complete summary of Year 1 activities will be shared in a forthcoming issue of Regional e-Notes. Across the island at the University of Hawaii, and in collaboration with the Oceanic Institute, the project “Utilization of local agri­processing by­products to produce fungal protein for aquatic feed production” is similarly looking into alternative aquatic feed ingredients. Microbial protein such as fungi biomass production on low­cost feedstock has gained significant attention due to cost effectiveness and long­term sustainability. Filamentous fungi, Rhizopus oligosporus is an ideal organism for animal feed applications due to its edible nature. This project is aiming to maximize the yield of edible fungus, R. oligosporus, on molasses, damaged papaya and taro wastes, and to develop a cost effective fungal biomass production process. Thus far, samples of the fungal biomass have been produced in the UH lab, and proximate contents and amino acid and fatty acid profiles have been analyzed. 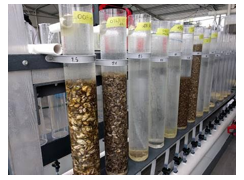 From that analysis, researchers have determined that the fungal biomass is a valuable feed ingredient for replacement of fishmeal in aquafeed. The project will now begin Year 2 activities to scale-up the process and replicate trials. PACRC in Hilo is continuing work on the project “Assuring Oyster Seed Supply for Hawai`i and the West Coast.” During this reporting period, work continued to develop methods to produce tetraploid oysters using a diploid male by triploid female cross with treatment with 6-DMAP. Dr. Ximing Guo made a second trip to Hawaii from Feb, 27-March 3, 2017 to assist with improving the tetraploid induction results and assist with improving the flow cytometry methods. So far, the work group has conducted inductions in 106 groups of larvae as part of this research. They currently have 25 induction groups which have been combined according to the percentage of tetraploids and these are being reared batches split between the Hawaiian Shellfish LLC nursery and the PACRC nursery (pictured). Batches have been split to avoid losing a complete batch if a mistake is made in the nursery phase. They continue to conduct inductions 1-2 times per week, depending on the tank space available in the two hatcheries.